We were all appalled to read yet another blog post about yet another trainee doctor badly treated on a regular basis by the medical culture system that we all belong to. Who are we? A group of clinicians who aggregate around an idea that we can be innovative in medicine and bring solutions to the table. Our thoughts naturally turned to rage as we reflected on the story of Dr Yumiko Kadota, as a plastic surgical trainee at Bankstown-Lidcombe hospital, was forced by her medical culture to be on-call for 180 hours straight amongst a litany of appalling work practices. Our group is broad and come from a range of backgrounds. Holding expertise in both medicine and other fields. This blog post was a joint effort by several individuals. We would love to tell you who each member was that contributed. But I am sure that you will understand why many of our members wish to remain anonymous. 1. Close The Accreditation Gap. One of the key issues in Dr Kadota’s case is that even though she is a trainee doctor, she is not a doctor actually in training. Paradoxically and perversely Dr Kadota is in training to become a doctor-in-training. This situation is due to bottle-necks in certain popular training programs, like plastic surgery. It leaves a situation ripe for exploitation where trainees in unaccredited roles can be exploited by hospitals because they are not officially backed up by the college and the hospitals know that there are many willing trainees ready to replace them. It creates a situation of what is commonly called “service roles”, which can also be interpreted as roles where you don’t get taught. The solution is for the colleges to take formal responsibility for unaccredited trainees in their specialty area. To ensure that there is a level of standard for the training and welfare of these trainees. If the colleges are unable or unwilling to do so then other authorities such as the Health Education and Training Institute, which in NSW already accredits hospitals for intern and resident teaching should be brought in to set and monitor standards. 2. Acknowledge That Fatigue Impacts Performance & Utilise a Pilot Style Regulation of Doctors. The aviation and other transport industries have strict rules in place enacted by CASA regarding how much sleep someone needs to have in order to operate a heavy vehicle which may also be carrying passengers. This is based surrounding a strong research base acknowledging that fatigue can have a detrimental impact on concentration and performance and at some levels, as great as being intoxicated. Why should doctors not also be viewed in the same way? Medicine is a challenging job in that every decision can potentially affect the lives of their patients, themselves or their colleagues. Fatigue can impact medication prescriptions and errors, surgical errors, patient identification errors. It can also impact a doctors well-being, impact their families and result in car crashes (and deaths) in the way home from shifts. Fatigue has the potential to kill and can be costly for organisations. Recent reports have highlighted the power imbalance that Specialty trainees, especially those in niche fields of medicine, have been treated poorly without representation of a college. They should be treated and respected as rare and valuable resources not flogged mercilessly because there are not yet accredited trainees or because there is a shortage of them. There are other ways of covering a specialty roster. Many hospitals in Australia do not have a 24-hour plastic surgery trainee doctor on call. Some don't even have a plastic surgeon at all. It is time to review rostering and to think laterally about how to ensure safety for patients and doctors. 3. Adopt a Chain of Responsibility Approach. Following on from the linkage to the airport industry. The heavy trucking industry has adopted legislation that makes everyone in the chain potentially responsible for adverse outcomes. If you put pressure on a truck driver to cut corners in order to save money for your business and that leads to unsafe driving you can be held criminally accountable for your action. We suggest making those in charge of rosters responsible in some way for supporting poor roster practices. It is not as if there have not been guidelines in place for some time to say what is and what is not acceptable. The AMA's National Code of Practice for Safe Working Hours was developed in 1999 and significantly redeveloped and refined since then. We have a tool. We can use it. If a senior doctor authorizes an unsafe roster then there should be a penalty to both that doctor as well as the hospital. Be it financial or some other sanction. Heads of Department will soon stop approving such rosters and either fight for change, advocate for resources or quit their role because they are not getting enough support from the hospital general manager. This pushes the problem higher up the food chain until someone decides to intervene. 4. Inform patients about how this affects them. For many years junior doctors and their advocates have attempted to change the system. The Australian Medical Association issued the first AMA National Code of Practice – Hours of Work, Shiftwork and Rostering in 1999. In 2007, the Royal Australasian College of Surgeons (RACS) published the Standards for Safe Working Hours and Conditions for Fellows, Surgical Trainees and International Medical Graduates. Yet the practice of junior doctors working unsafe hours continues. What do we mean by unsafe hours? As we have noted above. There is clear evidence that fatigue effects the health of the person with fatigue. There are many stories of doctors crashing their vehicles driving home from work. Medical trainees with fatigue are three times more likely to have an injury related to a sharp instrument like a needle-stick injury. Fatigue in pregnancy can increase the risk of miscarriage, premature labour, and low birth weight. There are many more documented effects of fatigue on the health of the person with fatigue. We know it is bad for doctors. We also know that doctors have higher rates of depression, anxiety and suicide than the general population. The evidence in medicine is less clear whether fatigue leads to unsafe care or medical error. But what we do know is that the effects of working continuously for 18 hours is equal to having a blood alcohol concentration of 0.05g/% and that 24 hours to a BAC of 0.10g/% or twice the legal driving limit in Australia. The RACS publication also states that approximately 33% of surgical errors are attributed to fatigue or an excessive workload. Yet there are paradoxes, the Royal Australasian College of Surgeons RACS also recommends that a work week of 65 hours is ideal for surgical training. This is based upon a review of the evidence and an acknowledgement that a certain amount of hours are required to develop to the level of expert. This takes into account factors such as working enough hours to gain the necessary skills to be a surgeon. So what does that mean for patients? Potentially that the doctor who is about to operate on you has not slept for 24 hours. Potentially that there is an increased risk of an error being made during your operation. So what can patients and their families do? When the doctor is explaining the operation, the benefits and risks of having the operation, or not having the operation, consider asking them whether they are in the high-risk fatigue category. Perhaps patients can help empower doctors to speak up. If a patient declines a treatment because they believe that their doctor is not safe to operate and no other trainee doctor is available to take over, then more senior doctors would have to be brought in (if urgent) or if not urgent the issue placed on hold until there is a well-rested doctor available. Dr Kadota’s story highlighted a situation where there was pressure to move patients through the system. Not necessarily because of any clinical urgency, but because other KPIs demanded that the plastic surgical trainee is woken for non-urgent matters. This situation would not arise in many of the hospitals in Australia. Because in many hospitals in Australia there is no 24-hour plastic surgical service. 5. Address The Supply and Demand Problem. Part of the problem highlighted in Dr Kadota's case is a demonstration of the issues of supply versus demand. Doctors are in relatively short supply in certain areas and specialty. The short supply means that doctor-impairment is tolerated by hospitals and society (i.e. a drunk/fatigued/depressed/burnt-out doctor is better than no-doctor). Another part of the problem is the ‘naturality-of-outcomes' in medicine – how is a member of the public meant to differentiate whether death or medical-complications arose from ‘bad luck', or an ‘impaired doctor' who missed something? They can't, and therefore the prospect of doctor impairment is never considered. Finally, there's the culture of obfuscation. When was the last time you as a doctor filed an incident report after discovering another doctor's mistake, or noticing another doctor was tired/fatigued/emotional? Aviation, rail and other transport industries have “fatigue-leave”, “normalised-incident-reporting”, supporting-fitness-for-work programs, and actively address the ‘authority gradient' that exists between hierarchy, for eg. Captains and First Officers. While the determinants of why bullying and burnout occur in medicine are complex, medicine like any industry obeys market-forces across human needs. Success may lie in understanding that market and making the nurture-of-doctors a market-commodity. This can be done by better demonstrating that doctors who are well and cared-for have better patient outcomes; have higher patient throughputs; save money; and improve patient satisfaction. Following on from the above point. There are plenty of models in health where other doctor and other health professionals can take on some or all of the role of a particular doctor who is in short supply. This can be as simple as changing the process for who takes the first call from another doctor. In Dr Kadota’s case she was apparently being woken in the middle of the night to receive calls about booking outpatient appointments. This function could easily be handed off to an administrative role. Some teams will utilise experienced nurses to take the first call and triage the need and priority. A great example of how this happens are stroke teams and mental health teams. This can be a fantastic opportunity for another member of the health care team to upskill in this role. But of course we have to be careful that we are not pushing the problem onto another part of the healthcare team by ensuring that everyone receives decent support and working conditions. 7. Use Social Media and Networks. Sites like messly enable trainee doctors to connect and share information about hospitals. The good the bad and the ugly. Call it a name and shame exercise if you will but since the United Kingdom started asking its medical graduates whether their medical school did a good job in preparing them for internship (called foundation year in the UK) the satisfaction reports have gone up significantly over time and some pretty prestigious institutions were forced to lift their game. One can imagine for example a public version of TripAdvisor for rotational hospitals where we get to see what the “well-appointed family friendly 3 bedroom unit” truly looks like before they get sent there. The public can also see what’s happening and hold the system accountable. Miko’s story has resonated strongly with one eminent specialist in our group. This person has been working as a specialist for a few years but has become increasingly disillusioned with the hospital system that does not support its workforce. Workforce cuts meant already overburdened staff having to take up additional work, compromising patient care. The staff had attempted to highlight the results of this, ranging from patient harm due to inadequate resourcing to the insidious deteriorating physical and mental health of the members of the team. Incidents reports were submitted, discussions were had at the appropriate committees and even letters written to management and the district CEO. Yet there was never a response, only non-responses or moves to hold the issue to the next meeting “lets put a pin in it” when it was not discussed. Miko’s treatment at this hospital is reflective of a wider systemic disease in the public (and private) hospital systems: the pursuit of KPIs or profit prioritised over the welfare of staff and patients. But more concerningly is the indifference of the healthcare system (Department of Health, State bodies, District Boards and Hospital Management) to recognising this disease and curing it. Failure to address this hurts staff and ultimately patients. The core business of hospitals and the healthcare system is to care for the unwell, return them to health and keep them healthy. This was the goal of the specialist in our group when they took up their specialist position in the public sector. After a few years, it was clear to the specialist that the hospital system disincentives and does not empower staff at the coal face to improve or address concerns or problems that are occurring. For these reasons, the specialist felt they had to leave as they were powerless to be able to change the system to the benefit of their colleagues and patients. Change which would have prevented Miko’s story can only come from within the health system. External pressures may drive this – Department of Health directives, The Media exerting pressure or Health Board Director prosecutions for failure to appropriately implement workplace health and safety procedures for staff. Whatever the drivers are, it will be management and health care providers who create and implement solutions which support staff to work safely and innovate for the patients we serve. Lets hope it does not come to a mass exodus of medical staff leaving the system. 9.Make Supervision a Formal Credentialing Matter. Senior medical staff have to go through an appointment and vetting process to get a role in any hospital in Australia. This process considers their training, qualifications, experience and expertise and determines what they are and are not permitted to do. Sometimes referred to as a scope of practice. It's generally about what sort of patients they are allowed to have admitted under their name, as well as what treatments, investigations, procedures and surgeries they can conduct. Nowhere in this process is there a consideration of their ability to teach, lead, supervise or just treat more junior staff members fairly. Having a trainee under your supervision should not be a right it should be earned. We should start by demonstrating this by not making the right to supervise and have trainee doctors in your team an automatic privilege. 10. Give The Best Teachers and Supervisors More of the Trainees. If a senior doctor is unable to provide good supervision to a trainee, chances are they are not getting the best out of this particular valuable resource. Give more trainee doctors to the best supervisors and teachers in the hospitals. Let them lead “super-teams” that get the work done in a challenging but rewarding manner. Those supervisors who demonstrate poor supervision skills should be left to do the work of the consultant and the trainee. There are many potential outcomes of this scenario. All of them are likely to lead to better patient care. In one. The poorly performing supervisors up their game through training and coaching and regain their trainee doctors. In the other the poorly performing supervisors leave the hospital and their places are taken over time by new consultants who have been trained to be the best supervisors by the best supervisors. In some States of Australia, the Award for trainee doctors is pretty reasonable. In Victoria, for example, trainee doctors get access to annual leave, as well as study leave, exam leave and even have access to a professional development fund. In NSW however, where Doctor Kadota worked, we pay our trainee doctor's the worst salaries in the country and we have an Award with all manner of antiquities and outdated conditions because it has not been updated for at least 4 decades. Trainee doctors struggle to get access to leave to study and prepare for exams and being sent to a hospital 150 kilometres away is not necessarily considered a rotation, where you get additional payments to support the fact that you are away from home. 35-year-old professionals (that's what a trainee doctor is) are often offered an un-family friendly one bedroom unit for their 6-month rural opportunity when they are living in a 4 bedroom house back at home with their spouse 2 kids and pets. 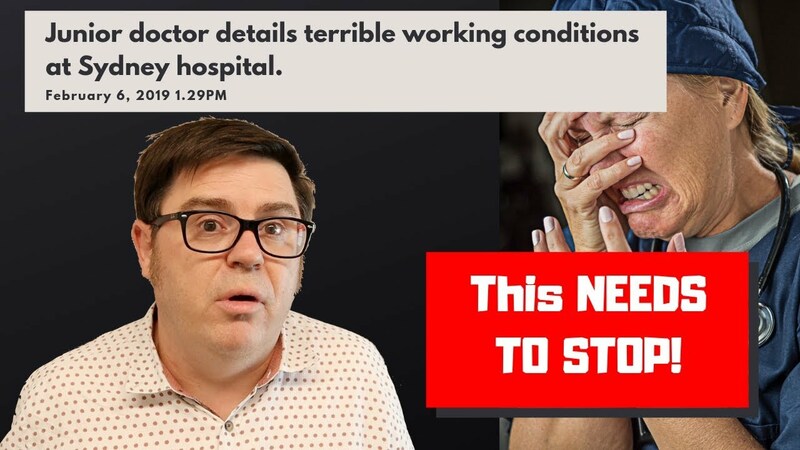 Every time there has been an attempt to bring in sensible and civilising new conditions to the Junior Doctors Award in NSW it has been met by resistance. The most recent attempt to fix a problem was a simple proposition that we should recognise that specialty trainees are in fact specialty trainees and should be paid as such. It met heavy resistance from NSW Health and ended in a farcical status quo. The main reason for this blinkered intransigence. Money. Every proposed award change is run over with an economic pen to see how much it will cost the bottom line. So that instead of making actual improvements to working conditions every year all that happens is a blanked percentage pay rise. As a consultant who works in NSWHealth I value the work that the trainee doctors do. I could not do my work without them. I get paid well enough. Well enough that I could and would give up my next annual salary increase if I knew and it was promised that this would go to fixing up some of the problems that trainee doctors experience. You can find Creative Careers in Medicine here on the web and join the facebook group here. May I suggest a completely underutilised resource? As a medical student, nothing was expected of me and as a result I never learnt anything. Most doctors seem to treat students like they’re dead weights, sometimes even forgetting that they’re there. We are told to come to ward rounds and fetch files but that’s it. I’ve had several terms where I was told to bugger off after. Medical students in other countries are expected to practice medicine under guidance. America, Canada, the UK, many countries in Europe all practice this, why not Australia? I never did a discharge summary until my Print term. I only assessed sick patients on one term and only after I begged my registrar for guidance. I am now a jmo and my only applicable education came from that reg and my elective terms overseas. Perhaps treating medical students like they’re a resource and not a burden could actually better prepare junior doctors for the real world, provide sufficient support (within reason) to an overburdened system and improve patient outcomes. Thanks, John I totally agree that we should better utilize medical students, particularly in their clinical years, as a way of preparing them for internship. It is interesting that you have had such unhelpful experiences. I’ve actually had the opposite problems at times, for example, encouraging teams to not give too many discharge summaries to medical students to complete (because they have probably learned enough from the 20 or so they have done already)! We should definitely treat medical students as valued members and learners on the team. Most medical degrees provide no training on how to teach, yet every senior doctor is expected to teach those under them. It should be no wonder that some senior doctors do a poor job of it, mistaking quantity of hours of practice for quality — and try to use it to justify overloading their juniors (and RACS supports it too). Where is the evidence and theory of education that proves this best ? Better education on how to educate is needed for our doctors. I agree with all of the above Anthony. I have noted that it is increasingly difficult to get a senior surgeon into the hospital after hours. The administration do not wish to pay them and I suspect that it has been a motivation to get rid of some surgical VMOs who do not trust the registrar to do it on their own and did come in readily. They also seem to want to get people so experienced by the time they are actually on a training pathway that they can manage all the after hours emergencies with the assistance of those hopeful of getting into the program but being paid and under taught in the meantime. This is also because the seniors do not want to get out of bed- unless absolutely necessary – they have already endured their time of being “flogged”. The flux of being on and off on call arrangements is not always easy to manage whether a surgeon or physician. The aging of the population has also changed the demographic and expectations enormously. We are all told to communicate better with our patients and their carers as well as between each other but the decreased LOS, eMR documentation and searching etc but the historical workforce allocations do not provide for that. Furthermore the management do not recognise the hidden costs of workforce fatigue on their budgets. We need to run an experiment of an ideal workforce provisioned hospital in 3 settings- regional, district and major metro teaching and demonstrate the cost effectiveness of a good rostering, work and training conditions. I volunteer to work in one! Sign me up for that hospital too!